-Is it bad that my son knows every word to Carrie Underwood's "Before He Cheats?" -Is it bad that I came out and found them polishing off a jar of pickles and a few Capri Sun's and didn't even have the energy to admonish them for digging in the fridge without permission? -Is it bad that I'm so scared of these crickets that when one was in our bathroom the other night I threw a towel at it and started hitting the towel with a shoe, panting the whole time like I was being chased by an axe wielding mass murderer? -Is it bad that I have two loads of laundry that I've never put away and I now have three more loads to wash today? Yes, that is bad. -Is it bad that I have come to so despise winter that I spent an hour yesterday watching the Travel Channel's 10 Best Beaches and longed to be sitting on any one of them? just read that diapers can hold up to 7 1/2 lbs.--you are being a good steward of the diaper; I go and get my clothes each day from the stack of laundry on my downstairs sofa; a giant-sized spotted cricket jumped out of Lexi's shoe before church yesterday morning while I was trying to stuff toilet paper in the toes to make them fit better (is that bad?). I screamed for Kevin, hiding behind the door and he pushed it down the drain, flushing it with water, only to come back up 3 minutes later to torture Alexis while she brushed her teeth. Hmm, sounds like we live parallel lives. Nothing that you have said on here is bad. I will have Claire take a nap even though she doesn't need one but because I need a break. Now do I pay for it later when she doesn't go to bed until 8:30pm, yes, but that is okay. I hear you 100% on the crickets. I don't know why screaming while you kill the crickets makes it somehow better but it does. The worst part is that once they are dead I can't bring myself to pick them up in fear that they aren't truly dead and that they will jump on me. BUT, my 3 year old has no problem getting a tissue or napkin and picking them up for me, now that is bad! I do the same thing when killing a bug!! I scream and hit it with one of Mikes big shoes.....and Mike wonders why the kids are so freaked out by bugs!! Okay, is it bad that my side of the closet has dirty laundry piled up in it?? Be proud that you got those 2 loads washed at least....you are doing better than me sister! not bad at all...or, if they are bad, i'm doing them too! cracked up at the cricket story. we have those in our basement too and they freak me out! but, this has been a good year; not many of them to be seen. i also make sure jack henry's diapers are full. at nearly a quarter a piece, they'd better be. and the carrie underwood thing? we're competing here with fergie, so don't worry about that one. I'd be screaming till the neighbors came running if I didn't have a central vacuum hose to do my bug/spider/cricket elimination work for me. That 6 foot vacuum pole makes me feel brave. Oh my.... seriously I have tears running down my face from laughing so hard. Thanks for the laugh!! Becke sent me over to read your poopy story:)... I can't imagine!! 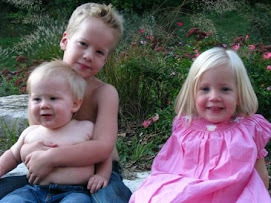 I'm a mom to three beautiful, hilarious, rambunctious little children. I am privileged to stay at home, though if I'm honest I'll say there are days when I crave the escape of an office. I'm a freelance writer and enjoy the creative outlet that writing provides. I lead a full, busy and blessed life. There is never a dull moment in the Stuart home.